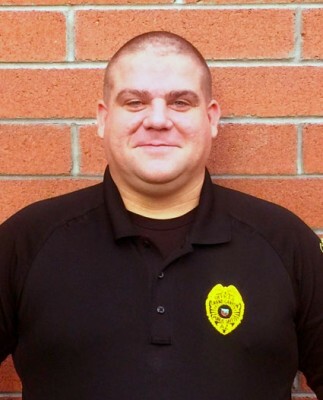 Over the summer, Public Safety Officer Matthew Grupe was on routine patrol on Grand Canyon University’s east side when he spotted what looked like an apartment building on fire off campus. His quick actions on Aug. 7 led to his rescuing a man in the apartment and earned Grupe the Medal of Life Saving from the University, which he received Thursday at a ceremony where he was surrounded by his colleagues. Officer Matthew Grupe was given a Medal of Life Saving Thursday for his heroism last summer during an apartment fire in the GCU neighborhood. After radioing in the information, Grupe drove east on Colter Street until he arrived at the scene of the fire. The one-story apartment building was engulfed in flames, and Grupe noticed there were vehicles outside, but no people. Grupe kicked in the door and went in, calling out as he searched for occupants. Eventually, he heard, “Hello.” It came from a man who had been asleep on the couch. “Buddy, your house is on fire,” Grupe said he told him. Disoriented from smoke inhalation, the man was led by Grupe to safety. But the man kept talking about dogs, Grupe said. Even as flames spread, the man returned inside to look for them, and Grupe followed. By this time, the Phoenix Fire Department was on the scene, and within moments the firefighters carried out the two canines, and were able to revive them. A Phoenix fire sergeant on the scene witnessed Grupe’s heroics and reported them, said GCU Public Safety Department Commander Kirk Fitch. 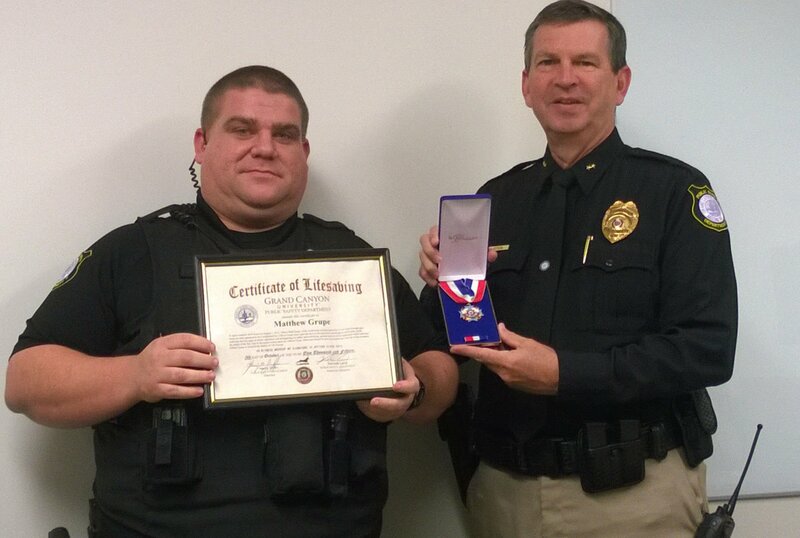 Grupe awarded Medal of Life Saving and certificate for saving a man’s life. “Officer Grupe put himself in peril to save the life of the occupant,” said Fitch, noting that the award is reserved for special acts of courage. After spending much of his career in high-risk security, Grupe said he finds it second nature to face danger to help others. Awesome job and well deserved Officer Grupe! Congratulations!!! You represent everything that GCU stands for…..saving lives!